Every color is the combination of Red, Green and Blue color. So we can generate any color by using red, green and blue colors .So, here we will vary PWM i.e. intensity of light on LDRs. That will further changes the intensity of red, green and blue color in RGB LED, and different colors will be produced. Below table shows the color combinations with respective change in duty cycles. We will use photoresistor (or light-dependent resistor, LDR, or photo-conductive cell) here in this circuit. LDRs are made from semiconductor materials to enable them to have their light-sensitive properties. These LDRs or PHOTO RESISTORS works on the principle of “Photo Conductivity”. Now what this principle says is, whenever light falls on the surface of the LDR (in this case) the conductance of the element increases or in other words, the resistance of the LDR falls when the light falls on the surface of the LDR. This property of the decrease in resistance for the LDR is achieved because it is a property of semiconductor material used on the surface. Here three LDR sensors are used to control the brightness of individual Red, Green and Blue LED inside RGB Led. Learn more about controlling LDR with Arduino here. There are two types of RGB LEDs, one is common cathode type (common negative) and other is common anode type (common positive) type. In CC (Common Cathode or Common Negative), there will be three positive terminals each terminal representing a color and one negative terminal representing all three colors. In our circuit we are going to use CA (Common Anode or Common Positive) type. In Common Anode type, if we want RED LED to be ON in, we need to ground the RED LED pin and power the common positive. The same goes for all the LEDs. 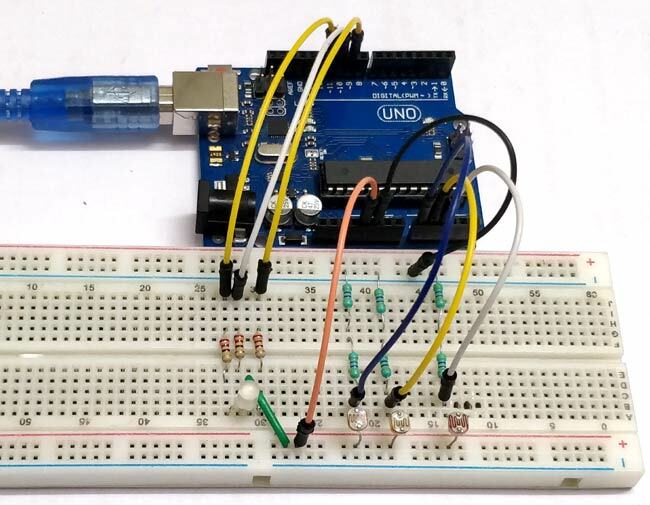 Learn here to interface RGB LED with Arduino. The complete circuit diagram of this project is given above. The +5V and ground connection shown in the circuit diagram can be obtained from the 5V and ground pin of the Arduino. The Arduino itself can be powered from your laptop or through the DC jack using a 12V adapter or 9V battery. First, we declare all the inputs and output pins as shown below. Declare initial values of sensors and leds as 0. In loop section, we will take output of three sensors with analogRead(); function and store in three different variables. We will get 0-1023 values from the sensors but our Arduino PWM pins have 0-255 values as output. So we have to convert our raw values to 0-255. For that we have to divide raw values by 4 OR simply we can use mapping function of Arduino to convert these values. As we are using three LDR’s so, when light incident on these sensors ,it’s resistance changes as a result voltages also changes at analog pins of Arduino which is acting as a input pins for sensors. When intensity of light changes on these sensors, it’s respective led in RGB will glow with amount of resistance changing and we have different color mixing in RGB led using PWM.